Consists of a light-duty impermeable polymeric sheet cuspated under heat and pressure to form a high-flow dimpled drainage core. The core is then bonded to a layer of non-woven filter fabric. The filter fabric retains soil or sand particles as well as freshly placed concrete or grout, allowing filtered water to pass into the drainage core. Limited to 20 feet of backfill. The identical properties as J•DRAIN 200 with the addition of a protection sheet bonded to the back side of the cuspated core providing protection for soft membrane waterproofing systems. J•DRAIN 220 is compatible with waterproofing systems without the use of a protection board. Limited to 20 feet of backfill. 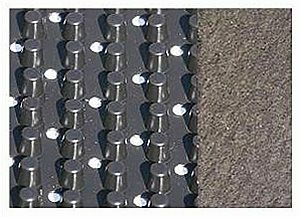 Consists of a moderate-duty impermeable polymeric sheet cuspated under heat and pressure to form a high-flow dimpled drainage core. The core is then bonded to a layer of non-woven filter fabric. 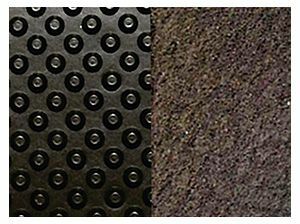 The filter fabric retains soil or sand particles as well as freshly placed concrete or grout, allowing filtered water to pass into the drainage core. The identical properties as J•DRAIN 400 with the addition of a protection sheet bonded to the backside of the cuspated core providing protection for soft membrane waterproofing systems. J•DRAIN 420 is compatible with waterproofing systems without the use of a protection board. Designed for extra heavy duty vertical and horizontal applications that demand greater compressive strength and improved filtration for challenging soil conditions. Heavier duty drain core & fabric. The identical properties as J•DRAIN 420 with the addition of a protection sheet bonded to the backside of the cuspated core providing protection for soft membrane waterproofing systems. J•DRAIN 420 is compatible with waterproofing systems without the use of a protection board. Consists of a light-duty impermeable polymeric sheet cuspated under heat and pressure to form a high-flow dimpled drainage core. The core is then bonded to a layer of filter fabric. 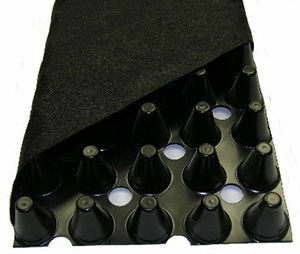 The filter fabric retains soil or sand particles as well as freshly placed concrete or grout, allowing filtered water to pass into the drainage core. Limited to 20 feet of backfill. Available with geotextile filter fabrics meeting AASTO M288-06 specifications for survivability. Consists of a moderate-duty impermeable polymeric sheet cuspated under heat and pressure to form a high-flow dimpled drainage core. The core is then bonded to a layer of non-woven filter fabric. The filter fabric retains soil or sand particles as well as freshly placed concrete or grout, allowing filtered water to pass into the drainage core. Available with geotextile filter fabrics meeting AASTO M288-06 specifications for survivability. 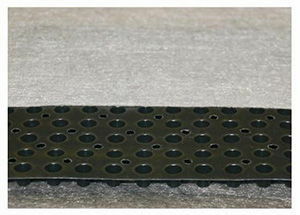 Consists of a perforated polymeric sheet cuspated under heat and pressure to form a high-flow dimpled drainage core. The core is then punched to allow double sided drainage, then bonded to a layer of non-woven filter fabric. The filter fabric retains soil or sand particles as well as freshly placed concrete or grout, allowing filtered water to pass into the drainage core. Consists of a heavy-duty impermeable polymeric sheet cuspated under heat and pressure to form a high-flow dimpled drainage core. The core is then bonded to a layer of woven filter fabric. 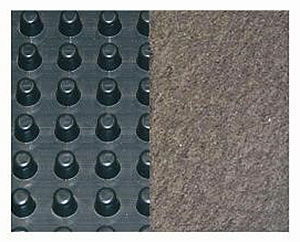 The filter fabric retains soil or sand particles as well as freshly placed concrete or grout, allowing filtered water to pass into the drainage core. The identical properties as J•DRAIN 700 with the addition of a protection sheet bonded to the backside of the cuspated core providing protection for soft membrane waterproofing systems. J•DRAIN 720 is compatible with waterproofing without the use of a protection board. Consists of a heavy duty impermeable polypropylene sheet cuspated under heat and pressure to form a high flow dimpled drainage core. The drainage core is chemically resistant and designed for applications where chemical exposure is possible. The core is then bonded to a layer of woven filter fabric. The filter fabric retains soil or sand particles as well as freshly placed concrete or grout, allowing filtered water to pass into the drainage core. Consists of a heavy-duty impermeable polymeric sheet cuspated under heat and pressure to form a high-flow dimpled drainage core. The core is then bonded to a layer of non-woven filter fabric. The filter fabric retains soil or sand particles as well as freshly placed concrete or grout, allowing filtered water to pass into the drainage core. Available with geotextile filter fabrics meeting AASTO M288-06 specifications for survivability. A modular composite drainage and collection system consisting of a 3-dimensional, high-flow, drainage core which is wrapped with a non-woven filter fabric. Available in 6,12,18, 24, & 36” widths. A high strength pre-assembled drainage composite consisting of a dimpled core with root resistant ECO fabric attached to the top layer and geosynthetic fabric attached bottom. The ECO fabric prevents fine particles from being washed out and prevents roots from becoming saturated and affecting the efficiency of the drain layer.The dimpled core has water retention chambers for storing water while allowing excess water to pass through “perforations”. 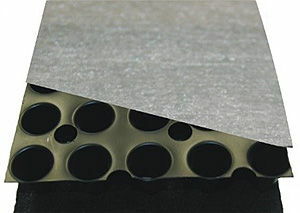 A high strength pre-assembled drainage composite consisting of a perforated, dimpled core with root resistant ECO fabric attached to the top layer and geosynthetic fabric attached bottom. The dimpled core has water retention chambers for storing water while allowing excess water to pass through “perforations”. Similiar to GRS, except GRS50 has a smaller profile height (.40 in.). Consists of a impermeable polymeric sheet cuspated under heat and pressure to form a high flow dimpled drainage core. The core is then bonded to a layer of root resistant ECO filter fabric. 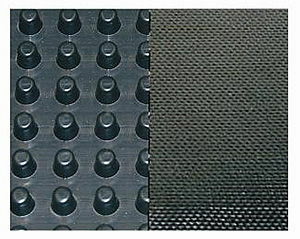 Consists of a heavy duty polymeric sheet cuspated under heat and pressure to form a high compression, high flow dimpled drainage core. The core is then cut into separate sheets to allow for expansion and contraction and then bonded to a layer of root resistant filter fabric. Designed to enhance G-Max performance for synthetic athletic fields. 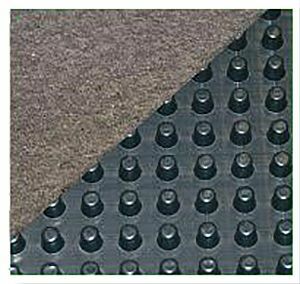 Consists of a heavy duty polymeric sheet cuspated under heat and pressure to form a high compression, high flow dimpled drainage core. 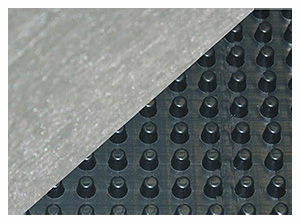 The core is available as impermeable sheet or punched based on application.